Is there any adornment more attractive than a full head of healthy hair? I think not, that’s why everyone panics when you suddenly discover your shower drain is clogged with your curly locks. It’s completely natural to lose some hair every day, and more as age creeps up on us, but then there is the sudden thinning or bald patches showing up. You can't even believe it at first, but then as your forehead seems to get larger you realize there is a problem. The true problem is the underlying cause—sudden hair loss can be a symptom of a disease process, so the first step is to check with your physician. Alopecia Androgenetica or, more commonly called male (or female) pattern baldness, is believed to be inherited, although the physiological cause is not fully known. The hair loss is usually gradual and increases with age. The other types of hair loss are often sudden, or patchy thinning areas, it is not a family gift and should be explored and treated. 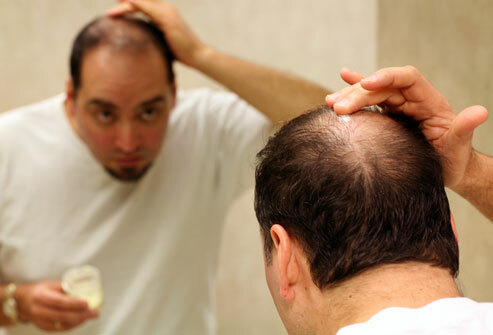 There are certain medications known to cause hair loss. Blood thinners, cardiac medications, even some birth control pills. Some medications can't be changed without risking more important aspects of your health, but others can. If you are taking prescriptions, ask your physician to find out if these are contributing to your locks falling out. Hormonal problems such as thyroid disease, insulin resistance, unbalanced testosterone levels, all these are known causes for hair loss. Autoimmune disorders are also credited with this loss as a side effect. So, if you had surgery under anesthesia a few months ago and now your hair is shedding all over the floor, you are probably wondering what caused this to occur. The answer is simple-stress, physical stress is a major factor and can significantly shorten the life of your hair. The good thing is that this's temporary and when everything returns to normal, your hair will eventually grow back. If your hair is suddenly thinner and you find you are growing less hair, have your iron levels checked. This type of anemia is a common reason for changes in your hair. Your diet may not provide the nutrients your follicles need to sustain life. If your alcohol consumption is more than your roots can tolerate, it may be low levels of vitamins, folic acid and iron. Blood loss is another factor to be considered. Infections whether bacterial or fungal can cause a loss of hair. This usually appears as patches of hair missing and can easily be corrected with the proper medications. Childbirth affects estrogen levels and often causes a temporary loss of excess hair. It normally grows back when hormones return to normal. Diet for weight loss equals too little protein and not enough minerals and vitamins. Your hair is in need of specific nutrients to survive; diet alone can prevent or inhibit new growth to replace the normal expected loss. Stress is a killer for sure. One thing it kills is hair. A serious tension for a longer period would have some negative effects over your hair. The best news is this hair will return once your anxiety is under control. Trichotillomania, a condition where people have an overwhelming urge to pull their hair out by the roots is also a culprit for hair loss. Inherited or genetic based hair loss is not something you can change, although new treatments are popping up all the time. Take the time to get examined and find out the reason. Many times you can change your diet, medications or treat the underlying disease process and mitigate if not halt your hair loss. Minoxidil: Used mostly for male or female patterned baldness. This is available at your local stores without a prescription. It’s in liquid form and you rub it on your scalp, which can cause irritations to the site. Some people have positive results in growth and show less loss of hair after 3 months of use. One unwanted affect is that you may grow hair where you don’t want it, like your forehead or your face. Finasteride: A prescription medication developed to treat genetic hair loss conditions. It is taken daily and is only available in pill form. There have been some reported results of hair growth and less loss of hair, but it is not without its negative side. The warnings for men are a possible link to increased risk of fast-growing prostate cancer. Women of childbearing age should not be exposed to this medication. Hair transplant: Now this is something amazing, small plugs are taken from one area of your scalp and planted to another area - where they grow into real hair again. It usually takes several treatments to combat the progressive nature of genetic hair loss. Scalp reduction: This is a procedure that sounds tortuous, but in fact, the scalp is not so tender. This surgical procedure removes the hairless scalp and closes the gap with sutures. In addition, a flap method is offered, which simply means they sew a flap of hair-covered scalp over the bald spot and it grows. If the previous methods for treating baldness do not appeal to you, there are home remedies that are reportedly successful for some. Egg oil was used historically in many cultures since the 11th century for healing wounds and in cosmetics. It is considered a natural treatment for dandruff, hair loss, and restoration of damaged hair, slows down the greying process, thus promotes hair growth. Reduce your stress to keep your hair on. Sounds easy right, well there are a few known techniques that seem to work. One is meditation, which reduces your stress and helps hormones return to normal. Exercise, whether you play a vigorous game of rugby or take a walk around the block, helps to reduce stress. It changes your mental focus and promotes relaxation. The proper nutrition for hair maintenance and growth is crucial. Below you can find specific information of nutrients needed and dietary sources for them. It’s a mineral high on the list needed for healthy hair which can be found red meats, leafy vegetables and beans. A much needed nutrient found in fish, oysters, beef and pumpkin seeds. Vitamin B, found in lentils, soybeans, sunflower seeds. If you have too little, you will have hair loss; if you have enough, you will have healthy strong hair. Sources are plentiful, such as lean red meats, beans, broccoli, soy, potatoes and dairy products. Improves iron absorption, and it’sbest to have foods rich in iron and vitamin at the same time. Citrus, salads and potatoes are rich in this nutrition. Massaging the scalp improves circulation and essential oils improve that even more. Lavender or sesame oils are common examples. Be careful and better gentle with your hair. Don't brush too hard or fiddle roughly with the hair. For dry hair, better not wash too frequently. Do not use heated styling tools too often, as they would cause great harm to the hair. When your hair gets tangled, use a thick and wide-teethed comb to separate it. Please mind not to try too tight hairstyles like sever buns.